19.1.1916 - 30.3.2019 103 years Born York and formerly of Subiaco and Duncraig. 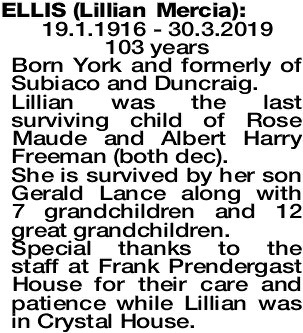 Lillian was the last surviving child of Rose Maude and Albert Harry Freeman (both dec). She is survived by her son Gerald Lance along with 7 grandchildren and 12 great grandchildren. Special thanks to the staff at Frank Prendergast House for their care and patience while Lillian was in Crystal House.